Maribor ( pronunciation (help·info) German: Marburg an der Drau) is the seicont lairgest ceety in Slovenie wi aboot 114,487 indwallers in 2013. Maribor is the lairgest ceety o the tradeetional region o Lawer Stirie an the seat o the Ceety Municipality o Maribor an aw. In addition tae its Slovene an German names, the ceety is kent as Laitin: Marburgum an Italian: Marburgo an aw. In 1164 a castle kent as the Marchburch (Middle Hie German for "Mairch Castle") wis documentit in Stirie. It wis first biggit on Piramida Hill, juist abuin the ceety. Maribor wis first mentioned as a mercat near the castle in 1204, an received toun privileges in 1254. It began tae grow rapidly efter the victory o Rudolf I o Habsburg ower Otakar II o Bohemie in 1278. Maribor athstuid sieges bi Matthias Corvinus in 1480 an 1481 an bi the Ottoman Empire in 1532 an 1683, an the ceety remained unner the control o the Habsburg Monarchy till 1918. 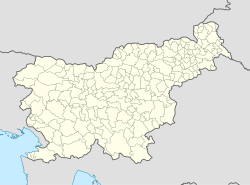 Maribor, previously in the Catholic Diocese o Graz-Seckau, became pairt o the Diocese o Lavant on 1 Juin 1859, an the seat o its Prince-Bishop. The name o the diocese (efter a river in Carinthie) wis later chynged tae the Diocese o Maribor on 5 Mairch 1962. It wis elevatit tae an airchdiocese bi Pape Benedict XVI on 7 Aprile 2006. The ceety o Maribor haes 12 destricts as leetit belaw, but the whole Municipality o Maribor an aa includes Kamnica, Pekre, Limbuš, Razvanje, Malečnik-Ruperče an Brestrenica-Gaj. The river Drava divides the destricts Center, Koroška Vrata, Melje an Ivan Cankar frae the ither destricts o the ceety. Thay are aw connectit wi 4 traffic brigs, 1 train brig an 1 pedestrian brig. ↑ 1.0 1.1 "Maribor, Maribor". Place Names. City of Maribor, web site. Retrieved 1 November 2012. ↑ "Twin Towns - Graz Online - English Version". www.graz.at. Retrieved 2010-01-05. Wikimedia Commons haes media relatit tae Maribor.